The range of Oolong teas is amazing and will delight you, explained by our expert, friendly tea master performing an age-old ritual. The class costs £55 per person. This class is by reservation only. Please drop us an email. Enter the exotic world of gorgeous ‘black dragons’! Learn about the finer points of Oolong tea appreciation while you’re transported to a faraway land of mountains and spirits and legends! ‘Oolong’ or ‘Wulong’ literally means ‘black dragon’, and the oldest types of Oolong tea leaf, from the mountainous Wuyi region, appear as long, twisted, black strands – very evocative of dragons! These teas, also known as ‘blue’ teas, were offered in tribute to Emperors in ancient times, dragons being a symbol of the Emperor, associated with such qualities as respect, integrity and power. 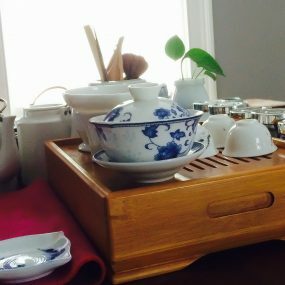 There is an incredible range of natural flavours and aromas among Oolong teas, varieties with an intoxicating charm like Honey Orchid Phoenix, Iron Goddess of Mercy and Frozen Summit. This masterclass is something truly special. By the end you’ll not only be able to tell the difference between a pouchong, a dancong and a yancha! You’ll feel deeply relaxed and remarkably focused, timeless, serene and mindful! ‘Discover Black Dragons’ lasts 2 hours and costs £55 (includes a selection of delectable and original teanamu patisserie). It is held on selected Saturdays at 10am. We reserve the right to impose a quorum of two participants For each class.